This post is sponsored by Spellbinderspaperarts.com. Although I am receiving compensation for this post, all comments and reviews of products received are mine and mine alone. I strive to only promote products that I think are excellent. 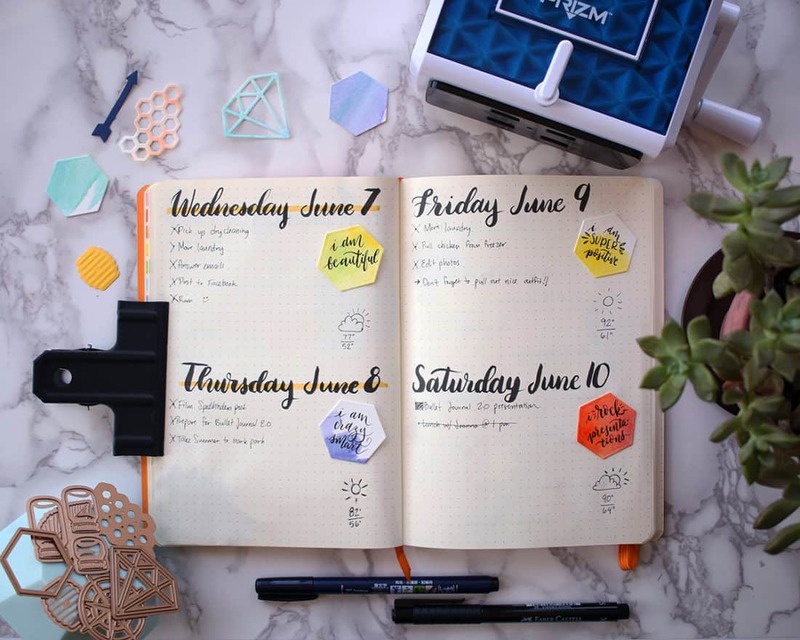 A big sore spot in the bullet journal community is figuring out how much effort to put into styling your planner. 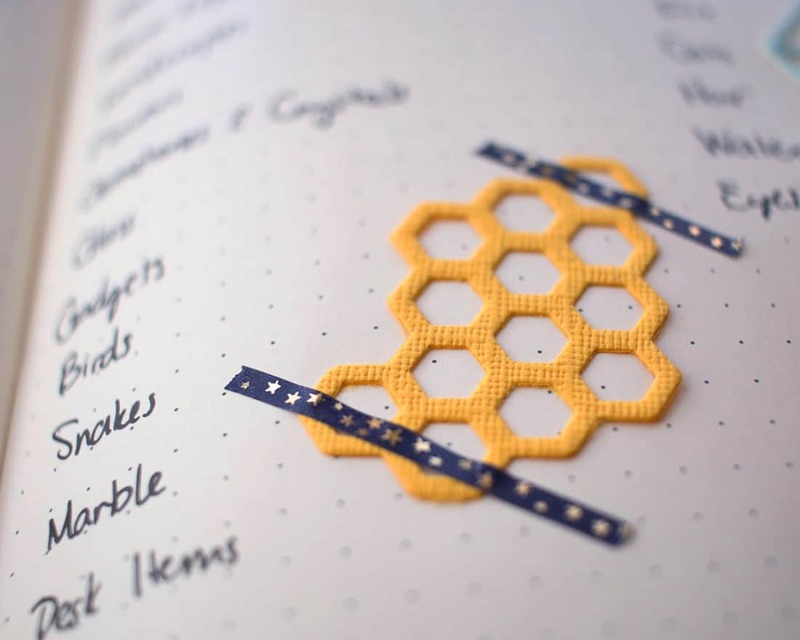 How much time should you take to decorate your bullet journal to your heart’s content? Lots of people struggle with this, feeling that they don’t have the time or the skill to beautify their journals. I totally get it. While I might have lots of artistic pages that I spend a lot of time on, I absolutely understand why not everyone wants to do that. 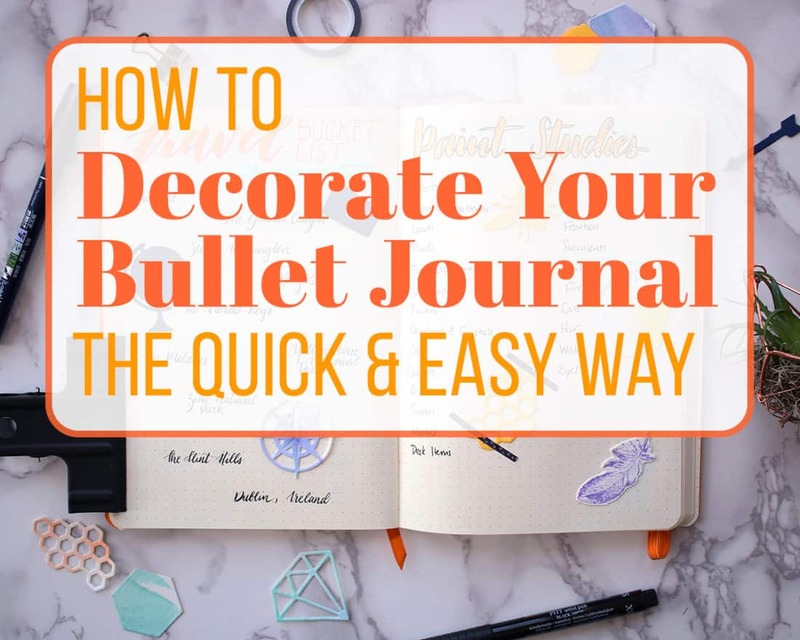 So I’ve gone hunting to find out how to decorate your bullet journal without wasting a lot of time. What I discovered is the Prizm die cut machine from Spellbinders. 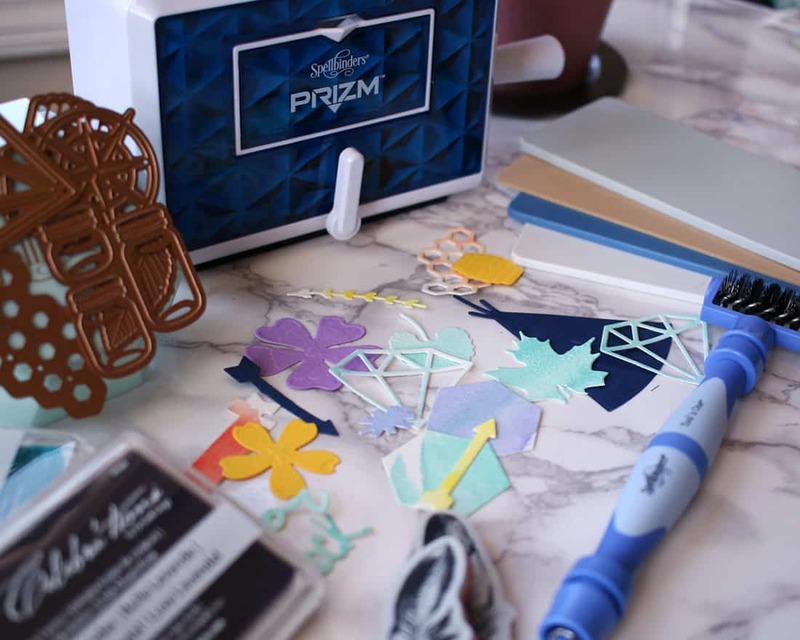 Basically, this little whiz of a gadget is a hand-operated press that allows you to create detailed cuts into paper with the help of their adorable etched dies. There are a ton to choose from – foilage, geometric patterns, arrows, animals – you name it! First, you’ll want to select the etched die and paper you want to use. Cut the paper so it will fit in the machine, which is 2 1/2 inches wide. Then assemble the sandwich according to the super simple instructions. And no, I’m not just hungry. It’s really called a sandwich! Once your delicious sandwich is assembled, open the doors of your Prizm machine and gently place the sandwich into the opening. Grip your machine firmly and crank the handle. By the way, that’s something I really love about this little fella. It’s not often you find a machine that doesn’t try to get fancy with batteries or cords. This is crazy simple and requires no electricity at all! Anyway, just crank the sandwich through and pop it out the other side. Disassemble your sandwich and viola! 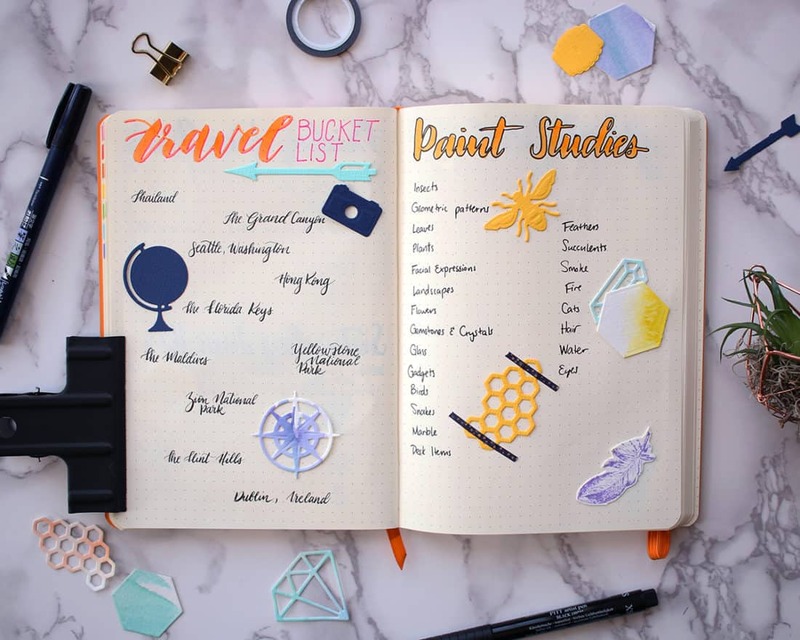 You will find a meticulously cut piece of art that you can stick right into your bullet journal. Easy peasy. And some designs have the option to emboss the design further. The process is pretty much the same, but with a different sandwich assembly. It adds a whole new dimension while you hardly lift a finger! The only issue I ran into while I was whipping out a million little designs was that some etched dies didn’t cut through the paper all the way. I started getting frustrated until I flipped to the last page of the instruction manual and discovered the solution. A quick and easy way to fix it is to simply slip another piece of paper into the cutting sandwich to add a touch more pressure. Then the designs should come out no problem! Some etched dies need the little bit of extra help, but I don’t mind so long as I get the awesome result! In addition to all the wonderful possibilities with the Prizm machine, I’ve found that another method for how to decorate your bullet journal is with stamps. I have a soft spot for stamps because my grandma was a stampoholic growing up. She had a whole craft room meticulously organized filled with beautiful stamps and rich inks. You won’t be shocked to learn that a love of all things paper runs in my family. Anyway, I was delighted to get my hands on some fantastic Spellbinders stamps and ink pads. A word of warning, though – you should always test out any ink in your journal to see how it responds to the paper before you start any big collection or spread. Keep a page in the back just for ink tests! I learned the hard way that this particular ink bleeds through a bit in my journal. But I didn’t let that stop me from using these sweet designs! Instead, I just stamped onto some scrap watercolor paper and taped it into my bullet journal. Because really, the extra step is worth it for these pretty stamps. 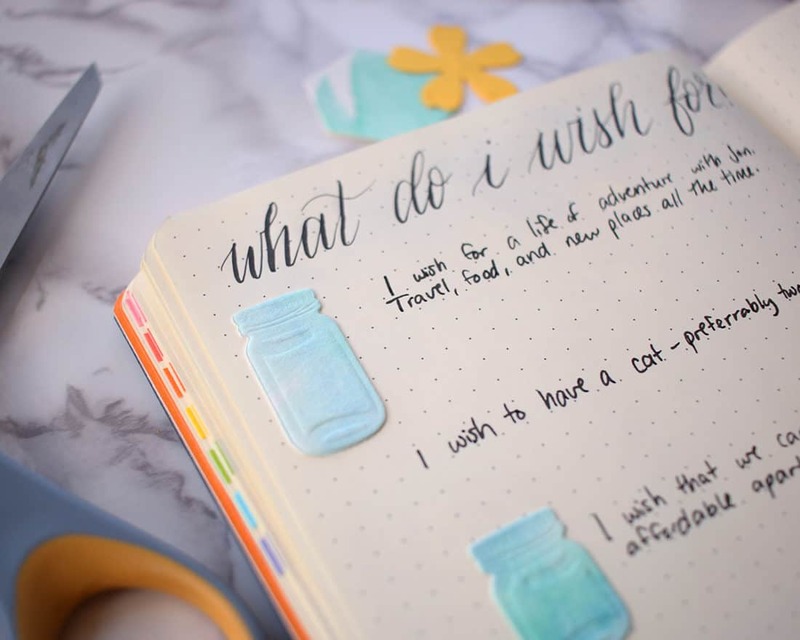 If you’ve been wondering how to decorate your bullet journal without a huge time investment and with no drawing skills at all, then here is your solution. You don’t need to have an artistic bone in your body to turn a crank and tape these cuties in your journal. You don’t need a ton of time because all the design has been done already. So what are you waiting for? Go make a journal that fills your heart with joy. After all, a bullet journal that bores you isn’t a very effective bullet journal. You need it to be interesting so you come back day after day and use it with excitement. Make it uniquely you and share your creativity with the world to inspire others! 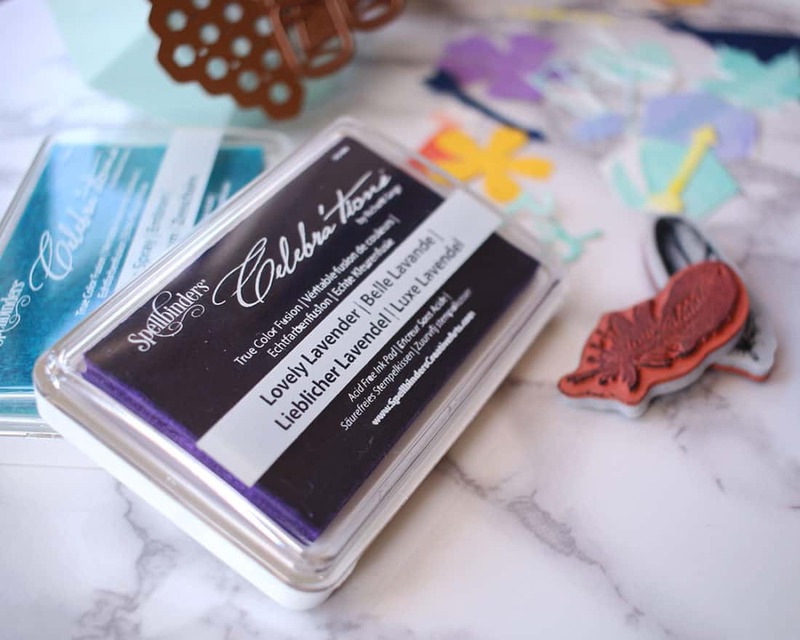 If you share your die cut designs or stamped sensations, use the tag #NeverStopMaking and #Spellbinders and spread the love!